Vicki said that she would like the wall between the kitchen and living room taken down. I don’t know what world I was in but I told her that I could do it. Before long she was asking when I was going to do it. By then I was getting just a little concerned. You see, it is a support wall and I really wasn’t sure what I was getting into by doing it. But I still told her that I could do it. I talked with a neighbor and he explained what I needed to do and what I needed to watch for. Anyway, one day I decided to begin the work. I took off the sheetrock from the kitchen side and then looked at what I would have to deal with next. It was the wiring and man was it a mess! Bro. Eugene Taylor taught me about electrical work but I must have missed the time he taught me about what was going on in that wall. But I started by undoing all the plugs, testing all the wires and finding out what breaker shut them down. I knew that I was in way over my head and since Bro. Eugene wasn’t around, I called Bro. Wayne Slater to give me some guidance. I’m sure he laughed to himself when he saw what he had gotten himself into. After working one afternoon, we had all the boxes moved, wired in and breakers back on. It all looked good and Bro. Wayne headed back home. It was then that I headed back to the attic to finish securing the wiring there. After I finished, I started down. I put one foot on the ladder and then it happened. The ladder fell and I was hanging on to keep from falling. Fortunately Vicki was home and came running. She got the ladder set back up and held it while I came down. I had done everything by the book as far as the wiring went, but failed to follow procedure when stepping down on the ladder. As I look back on that time, I realize even more how important it is to watch where you step. I truly believe that God was watching over me and directing my steps. Yes, the ladder fell. Yes, I was hanging from the ceiling. Yet, it was Friday afternoon and Vicki was off work and not out shopping. She was in the kitchen just a few feet from where I was hanging. I was not hurled headlong to the ground, because God was directing my steps. He was watching over me as I did things that I ordinarily would not be doing. He set me once again on solid ground. The next time I crawl down from the attic, I will be more careful about where I step. I will trust the Lord to direct my steps. But as I begin each day, I will remember this lesson and know that God has established my steps. He is directing me in the path He would have me walk. What about you? 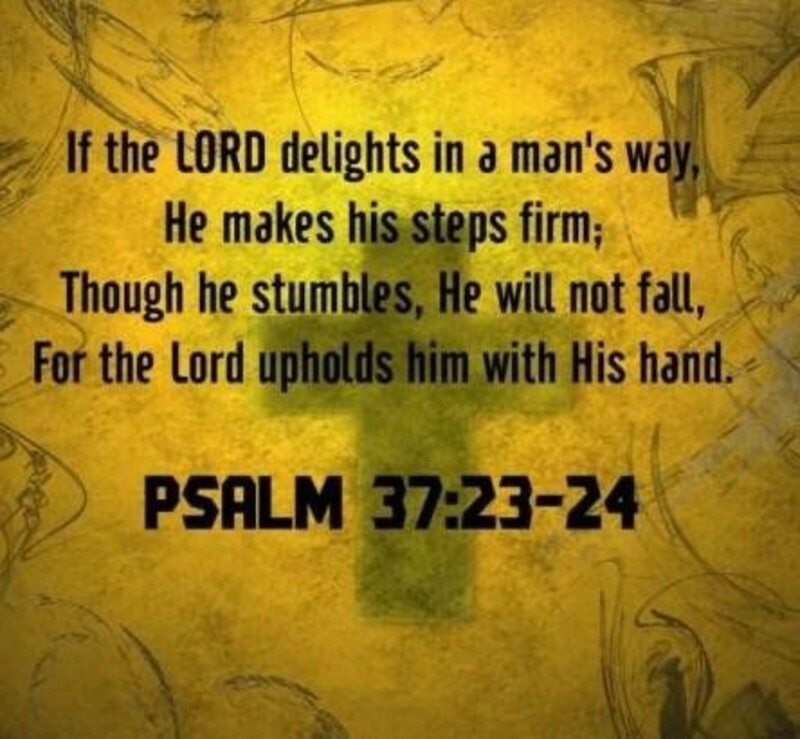 Are you allowing Him to direct your steps? 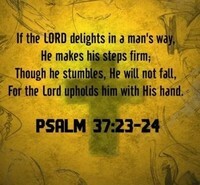 He will hold your hand and direct your steps if you will let Him.